To understand endometriosis, it’s helpful to understand the lining of the uterus’s walls, the endometrium, and the cells (known as “endometrial cells”) it’s made of. Endometrial cells are special: they grow abnormally fast in the presence of estrogen. When they grow, they create a thick inner endometrial lining of the uterus and this helps ensure an embryo can implant in the uterus’s wall. An embryo needs good implantation to ensure it receives nourishment and can develop into a fetus. Endometrial cells are helpful when contained in the uterus, but when they escape out of the uterus they cause havoc. When these cells land and establish themselves on other organs, they cause regional inflammation and damage. In effect, this is endometriosis. How Do These Cells Escape? For these endometrial cells to appear outside of the uterus, some system in the body has broken down. Below are three examples of how endometrial cells can surface outside of the uterus and, for this reason, endometriosis can be the end result of many different conditions. 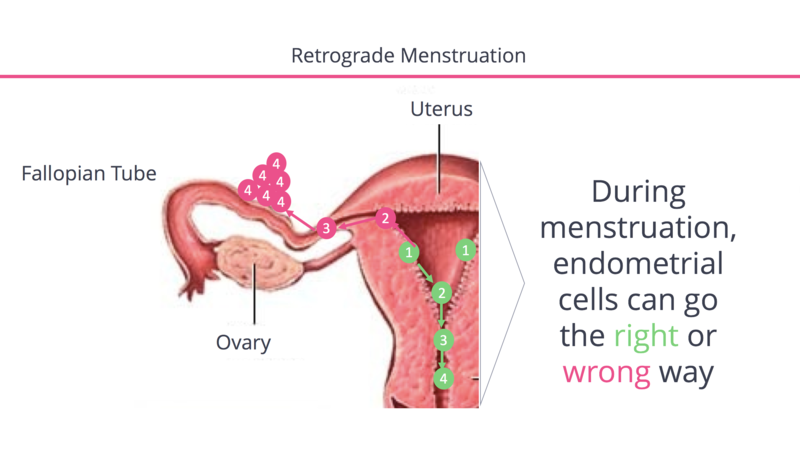 Retrograde Menstruation: Every month the lining of the uterus grows (in response to estrogen) in anticipation of potentially needing to house an embryo. If a pregnancy does not occur, the uterine wall disintegrates and endometrial cells are shed as a period, or menstruation. Occasionally, they move in the wrong direction and escape through the fallopian tubes and into the pelvis and abdomen. Spread By Blood: Endometriosis cells can develop in bone marrow and be distributed through blood vessels to remote locations in the body landing in organs far afield from the reproductive system, for instance in the lungs. Metaplasia: This is a phenomenon where healthy cells in the pelvis and abdomen morph into harmful endometrial cells for reasons we don’t yet understand. By implanting and eating into into the ovaries, endometriosis can reduce egg supply. Antral follicle counts (AFC) and anti-mullerian hormone (AMH) levels are two commonly used indicators of ovarian reserve, and recent studies suggested that patients with endometriosis have reduced ovarian reserve, even before attempts are made to remove the endometriosis. Surgery to remove endometriosis on the ovaries also can further reduce ovarian reserve. Endometriosis sticks closely to normal ovarian tissue and some normal ovarian tissue is inevitably removed during the removal of endometriosis from the ovary. Several studies have documented the reduction in AMH levels after removal of endometriosis. For patients with good ovarian reserve, these changes may not affect the likelihood of having a successful pregnancy, but for patients with already low reserves, particularly those who will need IVF, surgery may have a significant negative impact. 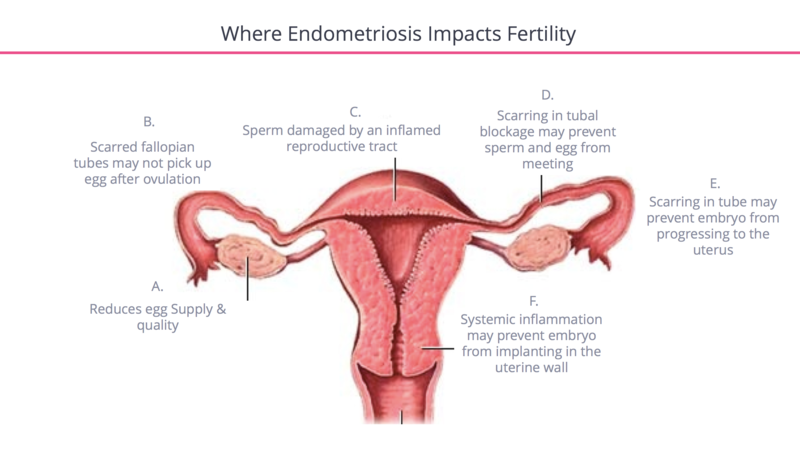 Additionally, endometriosis can create an environment which may worsen egg quality. A meta-analysis of 22 studies and 6,760 IVF patients showed endometriosis patients have lower fertilization rates and lower implantation rates per embryo than other patients (in this case, those with blocked tubes). Additionally a small study shows that embryos created with eggs from donors with endometriosis are far less likely to implant than embryos created from eggs of donors without endometriosis. This data has not been consistently reproduced in some other studies, likely due to the heterogeneity and complexity of endometriosis. Endometriosis and related scarring around the fallopian tubes can create blockages or abnormal function that prevent the egg or embryo from moving down the tube, or sperm from moving up it. This can prevent sperm from fertilizing the egg or, if fertilization does happen, impede the resulting embryo’s movement through the tube, increasing the risk of a tubal (ectopic) pregnancy. In one recent study of over 14,000 women, women with endometriosis were 2.7 times more likely to have an ectopic pregnancy than women without endometriosis. Though the absolute numbers are small, ectopic pregnancies can be very dangerous. When endometriosis cells colonize other organs, they cause inflammation. 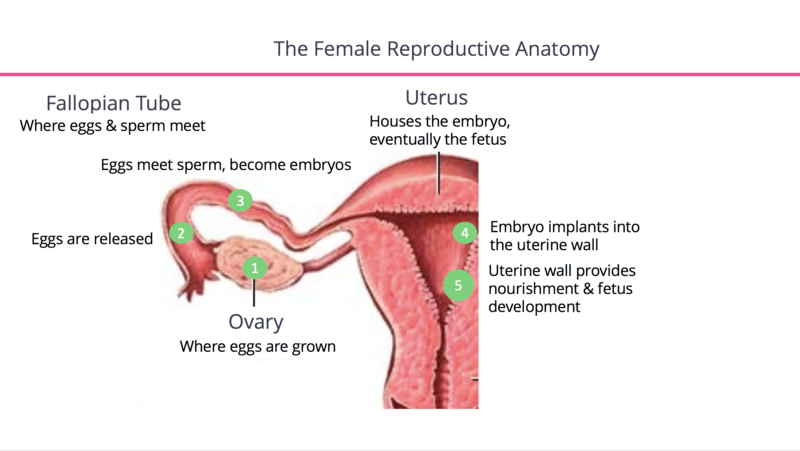 Since the uterus is part of a broader reproductive ecosystem, when other organs become inflamed, so does the uterus. This may impair the uterus’s ability to allow an embryo to implant and receive nourishment. An interestingly designed study showed that donor embryo recipients with endometriosis were at least 20% less likely to have embryos implant than donor embryo recipients who did not have endometriosis. Regardless of where endometriosis exists, it creates inflammation, and if sperm swim near the region of inflammation, their motility (ability to swim) and function may be impaired. The percentage of sperm with DNA damage doubles after exposure to pelvic fluid from patients with endometriosis compared to sperm exposed to pelvic fluid from women without endometriosis. Additionally, women with Stage I or II endometriosis have been found to have significantly lower fertilization rates after conventional IVF, although this may be due to egg factors as well. As you can see below, the combination of these factors make it much harder for women with endometriosis to conceive compared with the broader population. And while both infertility and pain are often hallmarks of endometriosis, below you’ll notice many patients experience one but not the other, or neither symptom. Said differently, patients may have endometriosis with no symptoms at all. Endometriosis affects roughly 1 in 10 women during their reproductive years. 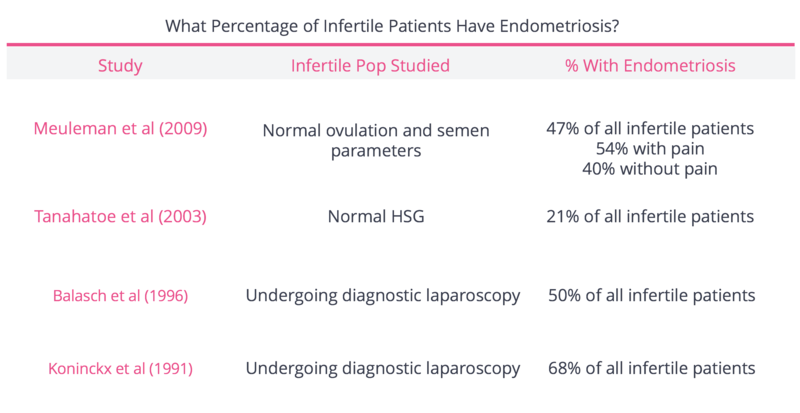 Among patients with infertility, endometriosis is at least twice as common, affecting 20 to 70% of women with infertility depending on the study. However, the true prevalence of endometriosis can be difficult to nail down because we are bad at identifying it in a timely fashion, if it all. As you can see below, most women with endometriosis report having to be seen atleast five times before being issued a diagnosis with an average delay of 10 years. This is because providers and patients dismiss or “normalize” menstrual cramps and other nonspecific gastrointestinal symptoms that may be a sign of endometriosis. Even OBGYNs are poor at diagnosis: 75% of the women studied below were first seen by an OBGYN. That said, there are women who are clearly at higher, or lower risk, to develop endometriosis. We break these up into genetic risk factors and other risk factors. Women with relatives who have been diagnosed with endometriosis are 6x more likely to be diagnosed with endometriosis than women with non-diagnosed relatives, leading us to believe that genetic factors play a significant role. However, we have a very loose handle on the interplay of endometriosis, environment, and genetics. At least half of risk factors for endometriosis are thought to be driven in part by genetic causes. But there is currently no genetic testing available that can predict who will get endometriosis in the way that, say, BRCA testing is useful for preventing or catching breast cancers early. A multitude of studies have assessed which patient characteristics are most associated (or disassociated) with a woman’s likelihood to develop endometriosis. Below we break down factors by their level of association and the quality of the supporting evidence. 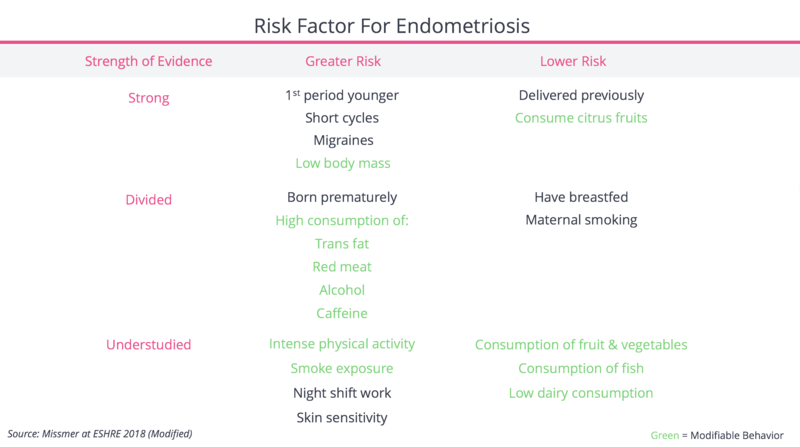 When looking at this data we should caution readers that “greater risk” and “lower risk” means that there was a positive or negative correlation between these factors and developing endometriosis. That does not necessarily mean “causation,” in so far as adjusting any of these factors may not change the odds a woman will develop endometriosis. Endometriosis is defined by the presence of cells that would usually be confined to the lining of the uterus, found elsewhere in the body. These cells can implant places as close as the ovary, or as remote as the lungs, although this is much more rare. 1 in 10 women are affected by endometriosis, but in women with infertility it is at least twice as common. Endometriosis is a complex disease with many different clinical presentations. It can cause pain, infertility, both, or neither. Specific to fertility, endometriosis has been negatively linked to almost every aspect of human reproduction: eggs, sperm, fallopian tubes, and even implantation of an embryo into the uterus. Doctors are bad at diagnosing endometriosis and, if you are not given a diagnosis, it does not mean you do not have it. The average patients requires 5 visits to be diagnosed. Patients with first degree relatives with endometriosis are 6x more likely to have endometriosis. We do not have reliable biomarkers to determine who has, or is at risk of developing, endometriosis.